The game’s story once again sees Sonic getting involved in a battle against Dr. Eggman–this time over the fate of the world. The conniving scientist recruits the expertise of a powerful entity known as Infinite, who he uses to make short work of the blue hedgehog. Six months pass and Dr. Eggman has nearly taken over the entire planet, leaving Sonic and his friends in a tough position. To combat the threat, a ragtag group of freedom fighters consisting of Sonic, a younger version of himself, most of his supporting cast, and a new character you personally create–simply named “the Rookie”–come together. Throughout your adventure, you’ll switch back and forth between playing as either Modern Sonic, Classic Sonic, or your custom character. 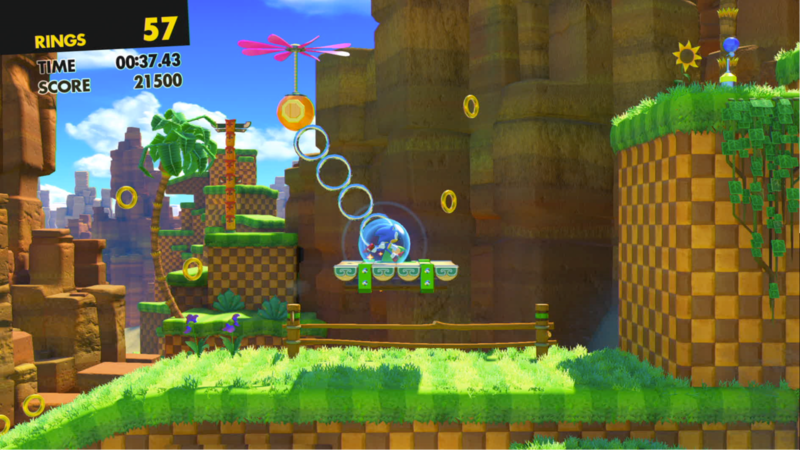 Both Classic and Modern Sonic play similarly to their past iterations, with some minor additions: Modern Sonic has a double-jump and Classic Sonic comes equipped with Sonic Mania‘s Drop Dash ability; both are welcome tools that better distinguish the two hedgehogs. But the biggest addition to the formula is your custom character, who sports special weapons called Wispons that grant unique offensive and movement abilities. 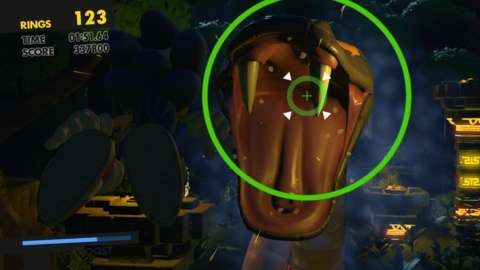 For example, the Drill Wispon allows you to quickly charge through foes or ride up and down walls. All three characters play distinctly from one another, and there are fleeting thrills to be had in plowing through robots with a speed boost or using a homing attack on a series of flying creatures to quickly clear a path towards the finish line. However, the excitement of these high speed escapades are held back by clunky platforming and unwieldy movement. Sonic Forces’ level design does little to accommodate your need for speed. Although Modern Sonic and your custom character have abilities that encourage you to push forward at a blistering pace, it’s often smarter to slow down. 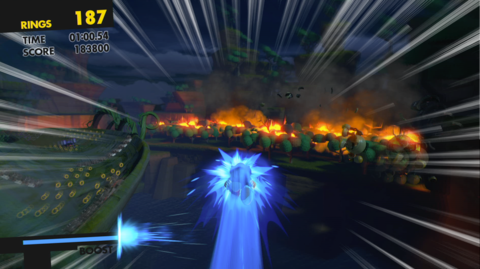 Telegraphing the right time to go fast has always been a major design issue in the series, but it’s magnified here, where obstacles and platforming sequences that require slower, more methodical movements aren’t as explicitly signposted as they should be. The game does a poor job of teaching you the flow of its design, instead relying on multiple frustrating and unfair deaths to educate you on the intricacies of a stage’s pacing. There’s a pervading sense of monotony across Sonic Forces’ seven unremarkable worlds. Nearly all the obstacles you encounter are rehashes of concepts and mechanics from previous games; lane-based level design, grind rails, speed boost sections, and side-scrolling platforming sequences all make a return. A set-piece sometimes breaks up the pace, but these encounters usually boil down to simplistic quick-time events that make you feel passive to the action happening on-screen rather than an active participant. Multiple routes or lanes in a stage create the illusion of branching paths, but they’re so brief that they feel more like quick diversions than actual alternate pathways. It doesn’t help that stages are also incredibly short, typically clocking in at two-and-a-half minutes. With cutscenes before and after each stage, you can’t help but wish there was a little more ground to cover before reaching the finish line. It’d be fair to write Sonic Forces off as another weak entry in the series. It’s numerous shortcomings make for an uneven, often frustrating gameplay experience. However, knowledge of its various flaws can make for a smoother second run through. In replaying for S-ranks it’s possible to use your accumulated knowledge of a stage’s hazards and its most illogical pitfalls, the growing pains of overcoming these obstacles slightly lessened. It was rewarding and enjoyable to go back to older stages to take the most efficient routes, knowing precisely when to increase Sonic’s speed to earn faster times. That said, acquiring S-ranks and completing challenges isn’t entirely difficult, which makes the endeavor of replaying stages short lived, especially considering how brief stages can be. And speed running or not, Sonic Forces’ ill-designed stages and poor handling are still major obstacles that detract from your time spent playing.